Donations after the BP oil spill - what some have called the worst environmental disaster in U.S. history - have paled in comparison to responses to other disasters. Donations to victims of the worst oil spill in U.S. history pale in comparison to other recent disasters, a development some philanthropy experts attribute to the blame factor. While there are no up-to-date authoritative figures on the total amount of corporate and individual donations to Gulf victims and restoration projects, observers say it's clear that giving is significantly less than the charitable response to disasters like the Haiti earthquake, Hurricane Katrina, the Sept. 11 attacks and the Asian tsunami. The big reason, they say, is BP. "It is true that donations are significantly less than other natural disasters, mainly because most people believe that BP is to blame for this manmade disaster and they should be responsible for cleaning it up," said Eugene Tempel, executive director of the Center on Philanthropy at Indiana University and a nationally recognized expert in the study and practice of philanthropy and nonprofit management. "There are some people who say they don’t know where to send funds. 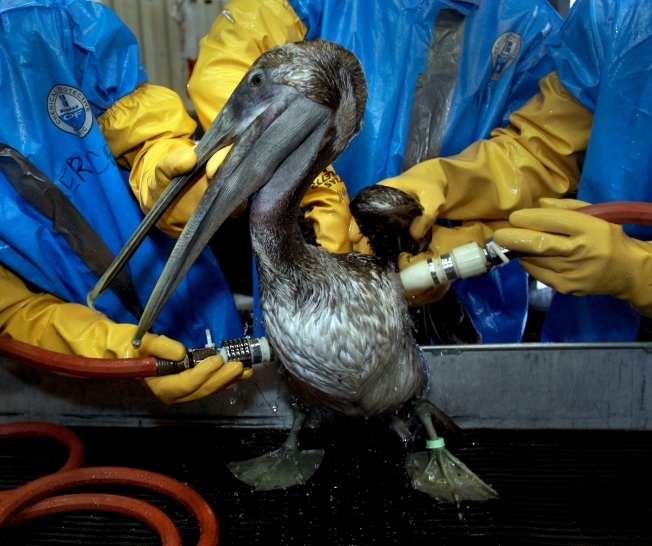 But mainly it is because people are holding back to see what BP is going to do about this." Eleven people were killed in the April 20 rig explosion that triggered the spill, which leaked an estimated 4.9 million barrels of oil into the Gulf of Mexico. BP has set up a $20 billion fund to pay claims from people and businesses who have been harmed by the spill. While environmental and wildlife charities have had some success raising money to clean up shorelines and rehabilitate oil-soaked animals, most of the groups trying to raise funds to help the human victims of the spill are having a much harder time. For example, in the weeks following Hurricane Katrina, Catholic Charities USA received more than $160 million in donations to help the needy of Louisiana and neighboring states, the Atlanta Journal-Constitution reported. In the weeks following the BP oil spill, the group has received just $37,000 to help out-of-work fishermen, oil industry workers and others, President Larry Snyder told the newspaper. The Chronicle of Philanthropy reported that six weeks after the April 20 Gulf rig blast, about $4 million had been donated to relief efforts, compared with more than $580 million within eight days of Hurricane Katrina and more than $560 million within 17 days of the earthquake in Haiti. A 2006 report by Indiana University's Center of Philanthropy looked at U.S. private donations in response to various disasters. It listed the top three as: $5.3 billion for Katrina and the Gulf Coast hurricanes of 2005, $2.8 billion for the 9/11 terrorist attacks and $1.9 billion for the 2004 Indian Ocean tsunami. "In all those three, you had large numbers and larger amounts of corporate giving and foundation giving. You see none of that going to the Gulf spill right now," Tempel said. More recently, donations in response to the Jan. 12 earthquake in Haiti that killed more than 200,000 people have surpassed $1.4 billion in the six months after the disaster, according to the Center on Philanthropy. That's not to say some companies aren't chipping in. Pepsi, for example, is giving $1.3 million through its Pepsi Refresh Project to ideas that "refresh" the Gulf. That's in addition to $20 million that Pepsi has pledged to give away in 2010 in the cause marketing effort, the term for collaborating with nonprofit organizations to bolster both charities and the reputations of companies, the New York Times reported. And Chevron has donated $750,000 to the Audubon Society for a volunteer response center in Mississippi. Part of the reason the philanthropic response has been muted is the relatively small human death toll as a result of the rig blast and spill. In comparison, more than 220,000 people died in the Asian tsunami, nearly 3,000 in the 9/11 attacks, and more than 1,800 during Hurricane Katrina and the subsequent flooding. "What the Red Cross will tell you is that if there’s a disaster and nobody gets killed, then fund-raising is very difficult," Tempel said. But the larger reason for the comparative lack of giving for the Gulf oil spill, observers say, is that there seems to be someone to blame here. "There’s no big Red Cross website, no big Red Cross funds going into it, nothing like that. It’s all because BP and federal government are going to be asked to make good on this," Tempel said. "Some of folks I’ve been talking to, the main theory is that this is a disaster that has a cause. People, individual donors, companies, foundations perhaps have been slower to respond because of the sense this is something that BP is responsible for," said Nicole Wallace, a senior writer at The Chronicle of Philanthropy, who has looked into disaster relief efforts. Other theories include the notion that natural disasters tend to draw more donations than manmade ones, Wallace said. "Since the BP crisis is a manmade disaster versus a natural disaster, it’s easy for people to point fingers at BP and the government, and for the government and BP to point fingers at each other,” Alison DaSilva, executive vice president of Cone L.L.C., which helps companies with philanthropic marketing, told the Times. “So it’s a little bit of the blame game, and that hardens the compassions of both consumers and companies to help out."